How convenient flying has become. Where our ancestors spent months on a boat travelling between countries, most countries are now reachable within a 10 to 15 hour flight. One captain reminded me of our attitude to flying when he announced, after landing in Johannesburg, that the safest part of our journey was now finished and advised us to drive home with care. One flight that unfortunately ended in disaster was South African Airways (SAA) flight SA295, the Helderberg, which departed Tapei, Taiwan on 27 November 1987 destined for Johannesburg with a stopover in Mauritius. At 23:48 the captain contacted the Mauritius air traffic controller, declaring an emergency due to a smoke problem and told the controller that they were doing an emergency decent to flight level 140. At 00:08 the air traffic controller tried in vain to make further contact with Springbok 295. Tragically the aircraft crashed into the sea approximate 240 km from Mauritius resulting in the death of 140 passengers and 19 crew members. The book 'Helderberg Death Flight 295' (ISBN 1 86812 322 7) written by Ronnie Watt gives a detailed account of the tragedy, the resulting search and the subsequent investigation into the cause of the crash. It was later established that a fire started in the front pallet on the right-hand side in the main deck upper cargo hold. The Helderberg was one of two Boeing 747-200B Combis in the SAA fleet and carried both passengers and cargo. The exact source of the fire has never been determined and to this day there remains a lot of speculation about this, ranging from computer lithium batteries, illegal fireworks and even missile parts that started the fire. What caught my attention in Ronnie's book was the mention of the name of Dr. Theuns Kruger, Director Technical of SAA and the hard work and many hours that he and others spent on the crash investigation. Sadly he was not the only Kruger involved in this tragedy. One of the cabin crew members listed is a Martha Kruger. I was a bit supprised by this and wondered where she fitted into the Kruger family tree. 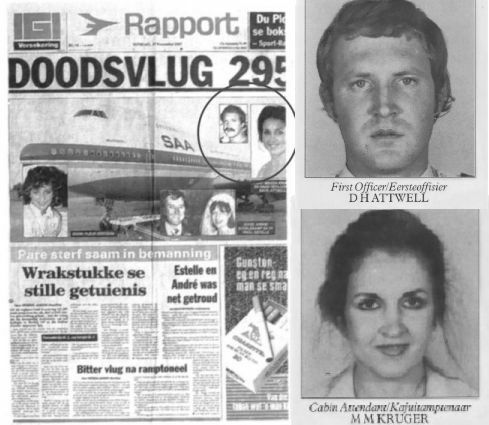 The Afrikaans Sunday newspaper, Rapport, dated 29 November 1987 had front page article on the loss of the aircraft and an article on a number of the couples that lost their lives. Under a photo of an attractive young lady the following caption appears: Dead: Magda Kruger and her fiancé Dave Attwell. His smaller photo also appears. The article refers to her as Magda and not Martha and I wondered why the fiancé of an airhostess would be on the same flight? The passenger list does not contain any Attwell's but the flight deck crew list does! The co-pilot / first officer is listed as being David Hamilton Attwell(36). She was engaged to the co-pilot! I have since tracked down a copy of a document released by SAA which included photographs of all the crew members and the photograph of crew member M.M Kruger, cabin attendant, bears a close resemblance to the photo of Magda Kruger that appears in the Rapport article. So does the photo of D. H. Attwell. The photos released by the SAA are of a much younger group of people and I suspect these are the offical ID photos taken when they were originally employed by SAA. I have also now found out that Magda's full names were Martha Magdalena Kruger. Sy het groot geword in Berglaan in Pretoria-Noord en het gematrikuleer in Pretoria-Noord Hoërskool in die vroeë 1970's. Sy het 'n broer gehad met die naam Jan, 'n paar jaar jonger as sy. Ek was 'n paar standards na haar. Magda was a very dear friend of mine, I was staying with her parents, Jan and Elsie Kruger, in Pretoria North when SAA came to notify us that SA295 was 'missing'. Despite the passing years I remember it like yesterday. Magda had three brothers, Jan, Ig and Johan and a sister Jenetta.